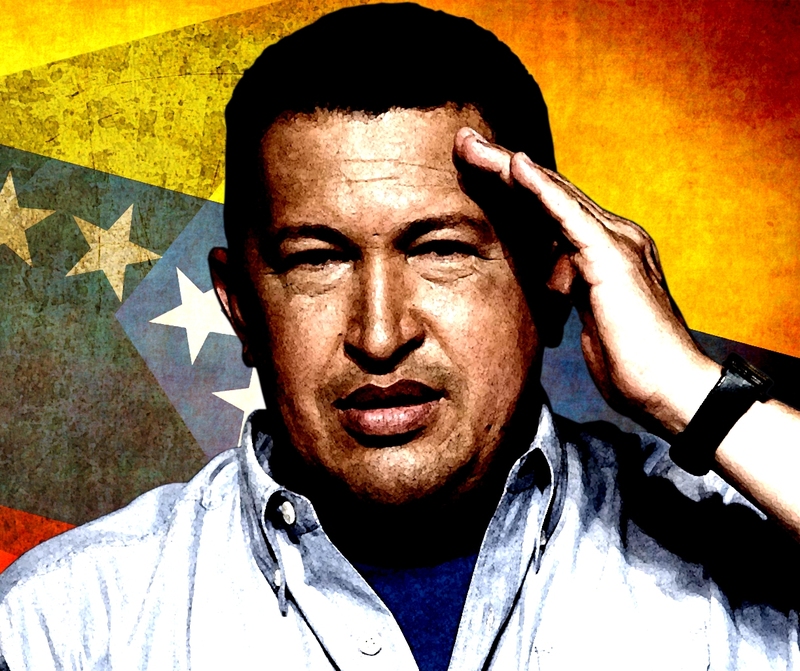 Hugo Chavez was a figure that had the neoliberals of the world worried. He led a democratic sweep of changes across his country, appropriating businesses, nationalizing oil wealth and providing services for the people and the poor, something that, according to the logic of the market’s apologists, cannot work. For all that Time magazine called him ‘garrulous and pugnacious’, workers and the poor in Venezuela voted for him time and again, in elections that have been declared some of the freest in the world. Chavez’s mandate was real, his achievements – from healthcare to welfare – notable, and his networks of support substantial. And this is to say nothing of the support he gathered internationally when he spoke out against Bush and Blair’s War on Terror. He became a leader for progressive people worldwide. However, Venezuela is still part of the capitalist world; it is no socialist paradise. The inherent contradictions of world capitalism still have their vicious effects in Venezuelan society. So what is Hugo Chavez’s legacy? The battle for historical memory has been going on in the months since his death, from the right-wing Economist arguing his was a ‘rotten legacy’ to left-wing obituaries arguing for his mission and project. Will he be seen as a democratic leader who thumbed his nose at American imperialism? A man of the people who fought entrenched poverty? Or will caricatures of an incompetent, ‘garrulous’ leader who caused crime to skyrocket win out? Chavez was shaped by oppression and the experience of poverty. His leadership was a response to a rapacious, exploitative system and, despite many problems and faults, he managed to keep true to his roots with Venezuela’s workers and poor, and deliver some extremely important reforms. It’s important to acknowledge where Hugo Chavez came from, politically. In the early 1990s Venezuelans were feeling the pinch of capitalism harshly. A US-supported government was forcing through neoliberal austerity measures on the orders of the IMF. Oil companies were taking more and more wealth out of the country with little return, poverty was at an all-time high. Chavez, a young military officer from a poor background, led a coup. He and his comrades were disgusted with the direction the country was taking, and sympathized with the suffering of the poor, but failed to win over the mass of the population. Over 100 lost their lives as their revolt was suppressed. The strategy of the coup was one that has been seen in many places before, especially in Latin America, where Che Guevara’s influence is strong. For those on the left, there is the idea that a small group of adventurers, by doing some great deed, could inspire the people to rise up against the enemy. This adventurism rarely works in history, and by its nature takes agency away from a mass movement. It aims to make changes, albeit well-meaning changes, from above. The uprising around Chavez’s revolt never happened. Coup leaders were unable to broadcast their message, and Chavez was arrested and jailed. The weakness of the government was exposed, however, and only a few years later Chavez won the 1998 presidential elections. He criticised both major parties for their austerity measures, and campaigned to reduce poverty and bring oil wealth back to the people of Venezuela. In 1999, his party, the Fifth Republic Movement, led a coalition in a Constituent Assembly that drafted a new constitution. This new constitution guaranteed democratic rights, including the right of recall against the president, and enshrined public healthcare as a human right. This provided the basis for 13 years and counting of ‘Bolivarian’ government. The Chavez government did not start out as enormously radical. Chavez continued to carry out many IMF-dictated policies in his first five years in office, focusing on foreign investment and appointing fiscally conservative leaders to high posts. However, even during these conservative years, his government spent $113 million on a project that used the army to rebuild roads; provided free vaccinations; subsidised food in the poorest parts of Venezuela and built up communities. Even with comparatively modest reforms, he was able to gain an increased majority in the 2000 elections, spurring him on to more radical reforms. It wasn’t until after the 2002 coup attempt, however, that Chavez started to truly change things, and Venezuela’s struggles intensified. The economic changes were huge. Chavez gave the government more control over the oil production of Venezuela, bringing royalties in to pay for social programs. Foreign oil production companies were made to pay a 30% royalty tax; for decades Venezuelan oil production had enriched foreign companies while leaving large swathes of the population in poverty. Chavez used OPEC to raise oil prices to get more funds for social programmes. He redistributed land to peasants, and made it legal for people to occupy and take over private land that was unused. He introduced price controls, trying to prevent rapacious businesses from punishing the poor for the government’s policies. When businesses tried to export all of their goods to get around price controls, the state nationalized them. Popular mobilisations played ever more important roles in Chavez’s reforms from this time on. He supported the creation of over 100,000 cooperatives, representing one and a-half million people, with the state preferentially buying its goods from cooperative organizations. 3500 community banks have been set up to give small loans to local people to build communal economies. They have set up supermarkets, selling food at least 35% below market value. Together with 6000 mobile soup kitchens, 22% of food distribution is being done socially. And here in New Zealand, Mana’s attempt to get kids in schools a decent meal is labeled ‘unworkable’! Social and judicial reforms too have been important. Local councils were set up with broad and wide-ranging remits, and democratic principles were focused on the grassroots level. These community and workers’ councils control over 40% of the state’s money, and use it to implement social programs from the community level up. The president himself is open to a recall vote at any time, as are numerous other positions throughout Venezuela. The judiciary is community-based, and their performance is assessed not by politicians in Caracas but by people in their communities. In the cities, massive programs were undertaken to improve housing for those in the slums. Proper roads were put down; houses were re-roofed. Improving the lot of Venezuela’s poorest has been one of the biggest aims of Chavez’s government. By any serious measure, it has been successful. Poverty has been drastically reduced, unemployment cut in half, and local and community cooperatives are flourishing without big multinationals to compete them out of existence. None of these reforms were won without a fight. The opposition, typically made up from the wealthy and middle class, consistently tried to defeat the reforms through intimidation, whining in bought-out media stations, and destabilisation. In 2002, they initiated the ‘bosses’ strike’, where the managers of the oil production facilities left the job after changes gave more power to workers. Opposition forces claimed it was a ‘general strike’ but most of the lower and middle workers in the oil industry turned up for work. Given help from the pro-Chavez military and retired workers, the workers were able to re-establish control and production. This attempt at destabilizing Chavez had failed, and many of the bosses and managers who had been involved lost their power. Before this, they had tried to initiate a coup attempt against Chavez, with military leaders taking him prisoner and falsely claiming he had resigned, abolishing the local councils, the judiciary, state governors, and trying to re-establish the pre-1999 constitution. A popular uprising in Caracas overwhelmed the pro-coup forces, and Chavez was back as president. The Revolution Will Not Be Televised, a TV documentary produced at the time, makes for compelling viewing. Perhaps most prominent opposition came from the privately-held media. Constant anti-Chavez advertisements were shown, and during the coup the privately-owned media ran stories falsely claiming that the president had resigned. During the bosses’ strike, they tried to tell people the schools were closed – a barefaced lie. They had no problem inventing stories from whole cloth to destabilize the state. Despite Chavez’s successes, major problems still exist. Inflation means that for all the government’s attempts to reduce the cost of food, power and the like, it is still difficult for many to get access to their basic needs. Subsidized petrol, which make driving in Venezuela cheaper than most other places in the world, exacts a heavy environmental toll, especially in the cities. Plans have been drawn up for rail transport, but this has not materialized. Corruption among officials is high, and violent crime is rising. It is important to try and understand why this is, why the social programs that have made life so much better for the poor and working class in Venezuela have not helped to reduce these problems. There is a contradiction at the heart of the revolutionary process in Venezuela. If, at many crucial moments, from 2002 on, Chavez mobilized workers and the poor to push his radical reforms forward, at other times change has been initiated from above. Programmes the government have accomplished have come from the top down. Venezuela is dependent on oil wealth, and that wealth is controlled by the state. For all that the government might wish to improve the lot of its people, it doesn’t stop the fact that reforms from above take agency away from working people. The union movement has been fragmented for a long time. The old regime’s council of trade unions was discredited and disbanded. While the government has not been as viciously anti-union as others in the western world, they have not promoted them as vehicles of change, focusing instead on state-financed cooperatives. Venezuela is still dependent on imports for many sectors of industry and because the government holds ‘all the cash’, as it were, it is inevitable that officials take advantage of that to improve their own station, much as capitalists exploit their position of owning the means of production. Capital – and access to cash – still dominates Venezuela. The oil money ‘sloshing around’ has meant crime has increased, as people use any means necessary to gain a little power and agency. Venezuela is not a ‘failed experiment’; the gains made by the Chavez government have been remarkable, but it is still a capitalist economy, and these contradictions have their consequences. With the death of Hugo Chavez, the movement that has been pushing the boundaries of what is possible in Venezuela has lost momentum. His personal charisma and style of presidency helped to smooth over the problems arising within the process, but his chosen successor does not seem to have that skill or political and moral authority. In 2012, Chavez won by over 10% of the vote. Maduro won by 1%. There is a string of reasons for this hammering in support. Maduro relied on his relationship with Chavez instead of talking about policies that could continue to mobilise and work for the poor. His speeches were garbled. His opponent had just finished his previous presidential campaign and was already on his feet and running. Participation was way down; barely 40% of the population voted. While Capriles talked about solving corruption and crime, Maduro talked in mystical terms about the spirit of Hugo Chavez. The focus on Chavez himself in the movement has taken a toll. However, the fact that Maduro still won, points to a hope the Chavista spirit is not dead. Typically for the Venezuelan opposition, Capriles and his wealthy supporters have had what can only be termed a petulant tantrum at the result. Claiming, along with Barack Obama and other US officials that the elections were rigged (despite numerous organizations, including the Carter Institute, assessing that they were among the most free and fair in the world) and demanding a recount of every vote (an impossible task that would take about twenty years to accomplish), the opposition has shown that it does not have any interest in democracy in Venezuela. The US government, alone in the world, has refused to acknowledge the result and demanded a full recount, a standard it doesn’t even apply to its own elections. This new-found commitment to democracy is laughable. The legacy of Chavez can be seen, paradoxically, in Capriles himself. Despite being the leader of the opposition, backed by the wealthy elites and US business, he does not openly propose a fully reactionary agenda. On the contrary, he tries to call himself a Bolivarian, and supports most of the social programs that Chavez started. Whether he is being honest is another question entirely; that this is the only way the right feels it can campaign is significant. The pull to the left in Venezuela is unlikely to be undone any time soon, and this is what is key. Chavez’s legacy does not lie in any particular reform or program, but in showing the poor in Venezuela what they can get, what they deserve. The future of the process now lies with the working class and the burgeoning union movement there. Further reforms, even relatively minor changes, will only happen with mass action. The ruling party and Maduro need to know that if they want to claim Chavez’ legacy, then they need to do more than maintain; they need to move forwards. The unions and workers need to start taking the lead in changing and continuing the transformation of Venezuela. Rail systems, infrastructure and workers rights will allow Venezuelans to start reducing their reliance on the state-owned oil companies and private business. In respect for Hugo Chavez’ penchant for metaphor, I’ll conclude with one myself; Venezuela is not a failed experiment, it is a rumbling engine ready for the brakes to be pulled off.